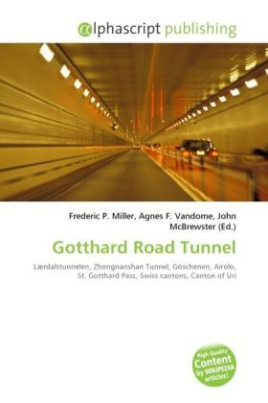 The St. Gotthard Tunnel in Switzerland is the third longest road tunnel in the world. It runs from Göschenen in the north to Airolo in the south, and is just under 16.4 kilometres in length below the St. Gotthard Pass. It links two Swiss cantons: Uri to the north and Ticino to the south. This road forms part of the shortest road link from Hamburg, Germany to Sicily in Italy. The Swiss government gave approval in July 1969 for the construction of a 16 kilometer Gotthard Road tunnel with four large ventilation shafts and an additional side gallery between 10 and 18 meters from the main tunnel, having its own independent ventilation system in order to facilitate the cutting of a second tunnel tunnels should future traffic levels require it. The tunnel would be longer than any existing road tunnel, and would provide year-round road link between central Switzerland and Milan to be used in place of the Gotthard Pass.